Den sidste aftapning i serien Smugglers Series fra Arran er på vej og kan købes fra den 12. juli 2017. Denne sidste udgave hedder The Exciseman. 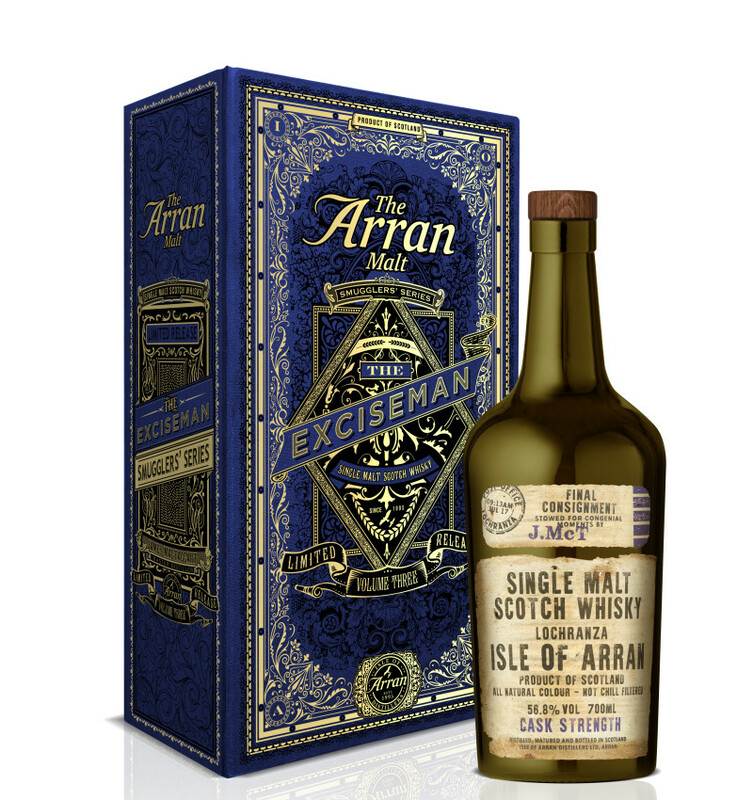 "In this Smugglers’ Series Vol.3 ‘The Exciseman’ we conclude our popular series which pays tribute to the exuberant character of those striving to outwit the Government’s representatives in the pursuit of the production of the famed Arran Waters. The Madeira casks used in this final volume, are similar to the ones utilised by Arran’s illicit distillers, who often stored and transported locally produced whisky in old Madeira casks brought over from the continent by their smuggling counterparts. The Quarter Casks are a nod to the type of small casks which would have been the easiest to transport. The resulting liquid is complex, full of character and a wonderful way to end a series which has so perfectly paid tribute to the independent characters of Arran over the centuries." The Exciseman kan købes fra Arrans webshop og der er en begrænsning på en flasker pr. person. NOSE: The rich honeyed character is immediate on the nose, luxuriously decadent. The fresh coastal character is also evident. Apples, vanilla and a touch of spice are also subtly present with a hint of toasted oak. PALATE: It coats the tongue and the notes of apple and vanilla are in abundance. No hint of dryness on the palate, it grows in sweet intensity and provides a rounded mouthfeel. The addition of water opens up the complexity beautifully and reveals a lighter sweetness of candied lemon. FINISH: Long, luxurious and yet delightfully fresh. The notes of apple and citrus give a lightness of character whilst the body remains solidly complex and robust. A typical Arran with an added layer of sweetness. The Exciseman er aftappet ved 56,8% alc.